WASHINGTON, Apr 16 2013 (IPS) - Two new reports, put out by a cross-section of U.S. environmental and public interest groups, are attacking central rationales for the construction of a major new Canada-U.S. oil pipeline proposal, which has emerged as an emblematic cause for green groups who have angrily denounced a U.S. government approvals process. A new study released Tuesday by eight of the country’s most established environmental advocacy groups suggests that U.S. regulators have massively underestimated the proposal’s environmental impact. Burning the heavy oil the pipeline would carry, the report warns, would emit more than 181 million metric tonnes of carbon dioxide each year – equal to the emissions of nearly 38 million cars or 51 coal-fired power plants. Over the course of three and a half decades, the report says, this would result in more than 6.3 billion tonnes of carbon dioxide, more than the United States’ total emissions for 2011. 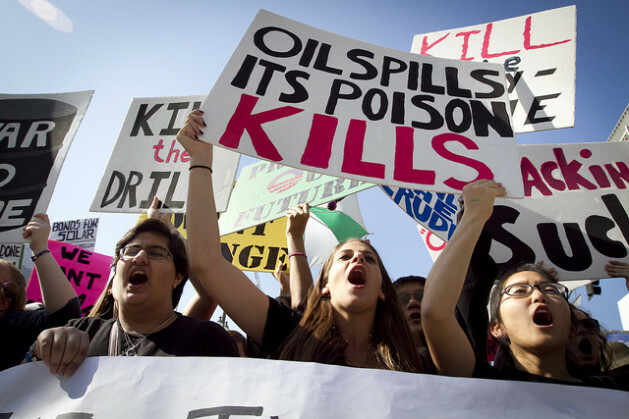 The proposed pipeline, known as the Keystone XL, would carry a particularly dirty and corrosive form of “tar sands” oil from Canada to refineries on the U.S. Gulf Coast. Because it would cross international borders, the pipeline requires approval by the U.S. State Department and a decision by President Barack Obama that the project would be in the “national interest”. In early March, the State Department released a draft environmental impact review (known as an SEIS) offering cautious endorsement of the project. It suggested the project would “not likely result in significant adverse environmental effects” and that the tar sands would be mined regardless of whether the Keystone project is approved. Since then, and with the SEIS currently in a public comment period, analysts opposed to the Keystone project have been able to deepen their scrutiny of both the SEIS and the public arguments currently in favour of building the pipeline. At the heart of this criticism is an observation of conflicting national policies: that approval of the Keystone XL would contradict stated U.S. climate policy. “At the top of a long list of problems with [the SEIS] is the simple assertion that the Keystone XL pipeline would have no impact on climate change … in the belief that these emissions will be released regardless of whether the pipeline gets built. This is simply incorrect,” Steve Kretzmann, lead author of the new report and a researcher with Oil Change International, an advocacy group, told reporters Tuesday. Since the Keystone XL proposal was first put forward by TransCanada, a Canadian company, in 2008, scientists have come to a clearer understanding of what’s today called the world’s “carbon budget”. This refers to the percentage of remaining fossil fuel resources that can be burned without bringing about the catastrophic forecasts of what could happen if the Earth’s average temperature rises more than two degrees Celsius by the end of this century. According to a major report put out in November by the International Energy Agency (IEA), two-thirds of proven fossil fuel reserves need to be kept in the ground in order to have a 50 percent chance of staying below that two-degree threshold. Climate scientists, meanwhile, put the figure far higher, saying around four-fifths need to remain untapped. “The State Department is using ‘business as usual’ projections for oil demand in the U.S., moving forward,” Kretzmann says. On Thursday, department officials are slated to meet with pipeline opponents in the state of Nebraska, where opposition to the project has been particularly vociferous. Yet in addition to the local and global concerns, new analysis suggests that the Keystone project could have a far larger-than-expected impact on a national issue that has long been highly sensitive for U.S. politicians: energy and gas prices. This data could undermine a key argument made by Keystone proponents, who suggest the project would strengthen U.S. energy security and bring down domestic prices. “When you look at the Keystone XL development, it’s clearly all about moving that oil to a global not a U.S. market,” Tyson Slocum, director of the energy programme at Public Citizen, an advocacy group, told IPS, noting that TransCanada’s own forecasts admit that current pipeline capacity is already adequate to provide oil for the U.S. market. On Monday, Slocum released a new investigation on the subject. That study also points to significant but under-reported investments in the Canadian tar sands by entities tied directly to the Chinese state. Slocum says such findings reinforce the sense that Canadian tar sands oil is meant largely for the global market. Following the end of the current 45-day public comment period for the SEIS, the State Department will release a final report before passing on the final decision to President Obama. While no timetable is yet available, some have suggested the president may make a decision on the proposal’s “national interest determination” by August.